Morality is neither objective nor subjective—it’s a practical enterprise enmeshed in human relationships. That gives it objectivity enough. By the same principles that prove the Old Testament a precursor of Jesus, Jesus is just as obviously a precursor of Hamlet. We are the stewards of Earth’s future in a way that no writer of ancient scriptures could have imagined. Are we equal to this responsibility? Because I was born an atheist, I was spared the indoctrination (brainwashing, child abuse) that produces helpless followers of one’s parents’ religion. A flash of insight—there is no God!—compels a years-long, but ultimately successful, search for answers. This Witness’s break from the family faith occurred, believe it or not, because of Romper Room. There were attractive—even seductive—features to the mysticism my parents inculcated in me. Only after converting to a vivid Christianity could one thinker come to realize how unconvincing it all was. Shedding the last vestige of religious belief—and embracing atheism—made me free. A flawed Supreme Court decision should dispel any illusion that America is quickly becoming more accepting of the nonreligious. Like spirit, words such as transcendence and reverence can’t help making us sound like we still believe in woo. A life with absolute certainty is no life at all. Things may not be what they used to be at my old Boston high school, but they surely are across a resegregating nation. Advocates for fetal “personhood” gain ground in part because scientists and clinicians quail from calling out their errors of fact. The separation of church and state in the U.S. constitution is more honored in the breach than in the observance. People who believe the United States can somehow be saved by a rebirth of religious piety miss the most profound lesson American history has to offer. 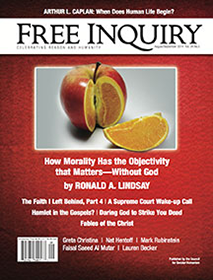 Letters from the August/September 2014 issue of Free Inquiry. Daring Pope Francis to reconcile his church to today’s world; New Orleans loses its last public schools. Though many have been falsely accused of daring God to strike them dead, those who really attempt the exercise invariably survive it. If the story of Jesus were true, ancient writers should have commented on it—yet 126 (and counting) who might have done so, did not. Modern humans (Homo sapiens) evolved but two hundred thousand years ago, or in about 1/18,000 (0.006 percent) of the time that Earth has existed. A review of The Age of Atheists: How We Have Sought to Live Since the Death of God, by Peter Watson. A review of Coming Out Atheist: How to Do It, How to Help Each Other, and Why, by Greta Christina. A review of Good Catholics: The Battle over Abortion in the Catholic Church, by Patricia Miller. A poem from the August/September 2014 issue of Free Inquiry.